This climbing schedule with combination of two mountains is always time-saving. It means that you need to acclimatize only once – when climbing Kazbek with its challenging landscape and without any chair lifts or other means of transportation. This also means that climbing Elbrus will take only one day and less effort after climbing Kazbek. Attention! In order to avoid disagreements between the participants, we always make the ascent to the higher, Western summit of Elbrus (5642m), and not to the Eastern summit (5621m), like other companies. Day 1. Meeting at Kazbegi village. The transfer from Tbilisi or Vladikavkaz can be organised separately. Day 2. Trek to the highest operating Orthodox Church situated at an elevation of 2170m. Preparations for the next-day climb. Overnight stay in Kazbegi village. Day 3. A 7–9 hours climb to the Meteorological station (at 3600m) through Sabetse Pass, with overnight stay there. Day 4. Acclimatization hike to a chapel at an elevation of 4000 m. Overnight stay at the Meteorological station. Day 6. 6–8 hours’ climb to Kazbek summit. Descent to the Meteorological station, with overnight stay there. Day 9. Early transfer to Elbrus foothill. Day 10. Climbing Elbrus with an early rise at 2–4 AM. 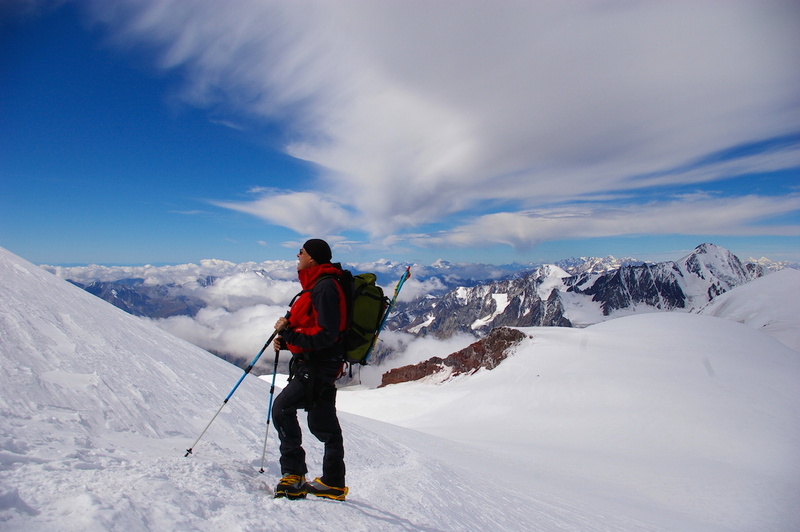 Elbrus climb lasts about 8–12 hours. It is possible to use a Snowcat during ascent or descent, but the decision to do so should be taken till 12 o’clock of the previous day’s program. Descent to the valley and transfer to airport (with flights scheduled after 9 PM). Overnight stays at the Meteorological station (Kazbek) according to the schedule.